Now that the Democrat establishment is using this fraudulent document to raise funds, does this not fall under RICO? Obama was made in good old U.S.A.
That’s true, but his birthplace is Kenya, ixnay? He is but a fraud, that is all I will say..
"We have not seen one credible response to this plethora of experts who have convincingly shown that Obama on-line Certificate of Live Birth is a forgery." Well, except for this expert. I am not a legal expert but this sounds like mail fraud to me. “Building confidence in U.S. elections is central to our nation’s democracy. The vigor of our democracy depends on an active and engaged citizenry who believe that their votes matter and are counted accurately. . . .
As a nation, we need to pursue the vision of a society where most Americans see their votes as both a right and a privilege, where they cast their votes in a way that leaves them proud of themselves as citizens and of democracy in the United States. Ours should be a society where registering to vote is convenient, voting is efficient and pleasant, voting machines work properly, fraud is minimized, and disputes are handled fairly and expeditiously. . . .
We have seen how Obama’s enablers call all those who question his eligibility to be racists and bigots. Now former President Bill Clinton is at it. He just compared sensible voter rights protection and ballot integrity measures to the Jim Crow laws and poll taxes. See the story here http://www.politico.com/news/stories/0711/58529.html. Here we see again, more demagoguery and race baiting. It's outrageous. Less than a month ago, DNC Chair Debbie Wasserman Shultz publicly admitted that she was wrong for making the exact same analogy. When are African Americans going to come out and tell these politicians enough is enough. They should just tell race-bating politicians that if they want their support, deliver something real rather than just racial pandering which does nothing more than divide our society. I hope that enough people will see your link to a report which you say debunks the forgery theory and that they will give their opinion on the strenght of that report. I will send off your link to my contact list and ask for comment. There is nothing about the layers that definitively proves or disproves forgery. It has always been my opinion that the PDF with its layers was intentionally published as a red herring. That article only addresses the assumptions of those who initially jumped on the layers band wagon without testing there theories properly. Although there is plenty of other evidence of forgery, the true test will be in the comparison of the PDF to the so called original, if it even exists. "I will send off your link to my contact list and ask for comment." By the way, I was in the U.S. Post Office today to mail a package. I asked the postal clerk to look up the zip code 06814. The clerk said it was for Danbury, Connecticut. Apparently the Hawaii DOH is comfortable with what the White House has posted. "Frequently Asked Questions about Vital Records of President Barack Hussein Obama II"
"On April 27, 2011 President Barack Obama posted a certified copy of his original Certificate of Live Birth." "For information go to http://www.whitehouse.gov/blog/2011/04/27/president-obamas-long-form-birth-certificate"
Now would they link to something that was a forgery? "It is for Danbury, CT but for APO addresses only. It is not for residential use. . . . And the ones that end in 22 and 26 have never been used." "Now would they link to something that was a forgery?" The question should be - Would they link to a forgery when they are feel that the original will never see the light of day? Who knows what people would do or why they would do it? Its not necessary to know the answers to those questions in order to know a document is a forgery. "There have been numerous requests for Sen. Barack Hussein Obama's official birth certificate. State law (Hawaii Revised Statutes §338-18) prohibits the release of a certified birth certificate to persons who do not have a tangible interest in the vital record. Therefore, I as Director of Health for the State of Hawai'i, along with the Registrar of Vital Statistics who has statutory authority to oversee and maintain these type of vital records, have personally seen and verified that the Hawaii State Department of Health has Sen. Obama's original birth certificate on record in accordance with state policies and procedures. No state official, including Governor Linda Lingle, has ever instructed that this vital record be handled in a manner different from any other vital record in the possession of the State of Hawaii." Hence, she said that Obama's birth certificate is kept in a regular place there and that no special procedure was adopted to store it any differently from any other birth certificate. In the MSNBC interview with Dr. Fukino, she said that "she found the original birth record, properly numbered, half typed and half handwritten, and signed by the doctor who delivered Obama, located in the files." How do you explain that per Dr. Fukino the underlying paper Certificate of Live Birth was supposed to be half typed and half handwritten which what is on the internet is not? 2. Who created the Hawaii web page and link to the White House birth certificate? 3. Is the person in No. 2 one of the ones who has actually seen the real long-form paper document? 4. Did the person in No. 2, if he/she actually saw the paper document, actually compare the on-line image with the underlying paper long-form birth certificate? 5. Has any other official in Hawaii who may have seen the paper birth certificate actually compared the on-line image with the underlying paper long-form birth certificate? 6. There is a growing public consensus that maintains that the on-line BC image is a forgery. Why does not Hawaii put out a press release assuring the public that the on-line image matches the paper, long-form birth certificate? Why does Hawaii expect us to read its mind by just linking to the White House BC image? 7. With the paper, long-form Certificate of Live Birth not having been examined by any controlling legal authority, how do we know that it is not a forgery? What is suspicious in this regard is that Obama waited about 2 and ½ years to release his long-form Certificate of Live Birth when the long form contains nothing which in any way is damaging to him but rather only helps him. "It is for Danbury, CT but for APO addresses only. It is not for residential use"
In 1980, the military postal systeme was reorganized. What was it like prior to 1980? Even if in 1977 it was assigned to the APO system, how would that affect the SSA looking at a list of zip codes? Would the only affect be to have the letter kick out of the automated system and then be hand sorted? If not how can you prove it? We know of at least 3 people. Dr. Fukino, Dr. Onaka and Director Fuddy. We know that Dr. Fukino and Dr. Onaka saw it prior to the November, 2008 election. And that Director Fuddy and Dr. Onaka saw it again in April, 2011. "A nurse or clerk in the hospital fills in the certificate form and gets the mother to sign it. Then the attending physician enters certain medical data and affixes his signature. Finally, the hospital sends the completed certificate to the local registrar." All birth certificates given to the parents are abstracts that exclude medical information. If the doctor fills in this medical portion by hand as oppose to typewritten, then roughly half of the vital record would be handwritten. This medical information portion of BC that is on file is still protected information. Why would Dr. Fukino who has donated to the Republican Party lie for the President? Why would Dr. Onaka a long time DOH employee lie? "The answer to this question is important because Governor Abercrombie, when he recently looked for the long-form birth certificate, told us that he could not find one." Can you provide a direct quote from Gov. Abercrombie? He did say that he was going to look in the Hawaiian Archives, two very different departments, to see if there was anything there that may verify the facts. So I gather from what you are saying is that Dr. Fukino, Dr. Onaka and Director Fuddy did not have any problem seeing Obama's original paper long-form birth certificate. If they knew where it was and they had to know that Governor Abercrombie was looking for proof of Obama's birth in Hawaii, why would they not have told him where to look for that proof rather than have the Governor looking around for some writing and making a fool out of himself? Or given that a former Congressman and current Governor of Hawaii would know his way around a state government, Abercrombie did not even need for them to tell him where to look for the birth certificate. Why did he just not go to the Department of Health and take a look himself just like the three of them did and then tell the world that the birth certificate was indeed there? Also, from your response, you are saying that the public has not seen the complete Obama long-form Certificate of Live Birth, for hand-written medical information that is part of the original birth certificate has not been released. Note that the article is written by Dr. Milton R. Wolf, who "is a board-certified diagnostic radiologist and cousin of President Obama. He blogs daily at MiltonWolf.com." Gov. Abercrombie's stated goal was looking for information that he could release to the public. A Vital Record does not fall into that category. Why would he need to go look at the record, he doesn't have doubts about its validity and there is a question whether as governor, he could just go and look at anyone's vital record. Yes, all birth certificates contain medical information, your original birth certificate contains medical information. Some pertains to the newborn, some pertains to the mother. All is protected by privacy laws. Speaking of Law of Nations, the DC Disctrict Court of Appeals exoked it AND "the Common Law" today in a case, and "law of nations" was part of the holding. "For the reasons that follow, we conclude that aiding and abetting liability is well established under the ATS. We further conclude under our precedent that this court should address Exxon’s contention on appeal of corporate immunity and, contrary to its view and that of the Second Circuit, we join the Eleventh Circuit in holding that neither the text, history, nor purpose of the ATS supports corporate immunity for torts based on heinous conduct allegedly committed by its agents in violation of the law of nations." Maybe Vattel's Law of Nations is not US law, but apparently the body of law known as natural law, the law of nations, is, and it is known as "common law". "Eleven villagers filed a complaint in 2001 alleging that Exxon’s security forces committed murder, torture, sexual assault, battery, and false imprisonment in violation of the Alien Tort Statute (“ATS”) and the Torture Victim Protection Act (“TVPA”), and various common law torts. (The Doe I complaint.) Four other Aceh villagers alleged in 2007 that Exxon committed various common law torts. (The Doe VIII complaint.)" explaining why the LFBC is not a fake. My response - so what? Clearly, somebody is full of sh*t. Either the many, many experts that say it's fake, or the Obot that wrote this analysis. One thing missing are the credentials of the 'expert' in this case. I would like to see one of the experts, Mara Zebest et al, comment on this 'analysis'. I'm guessing that what is being put forth in this post doesn't hold water - just guessing. Based on the details given by those that say the LFBC is forged, I have a hard time believing they are all full of it. Mario, you need to add the Obama campaign to your indictment. They’ve been distributing coffee mugs and t-shirts, emblazoned with the allegedly forged birth certificate, since at least mid-May. In fact, you may want to add me to the defendant list, as an accessory after the fact, because I have one of the t-shirts and intend to continue willfully flaunting it in public while soliciting support for the Obama campaign. btw, I received the DNC’s solicitation letter several days ago but wasn’t, until now, planning to donate because I’ve already given several times to the Obama campaign. On the other hand, I did kind of want one of those coffee mugs, so now that you’ve raised my ire with your latest preposterous claim, I will be sending a donation to the DNC, too. Thanks for helping me make up my mind! You are limiting Gov. Abercrombie's purpose to confirm Obama's birth in Hawaii to justify his failure and embarrassment in what he accomplished in that regard which was nothing. In fairness to you, provide evidence that his purpose was limited to "looking for information that he could release to the public” and that he was not interested in looking for a “Vital Record.” How do you know what his specific purpose was? Also, he did not release anything to the public. Does that mean that he did not find anything at all that he could release? That would be inconsistent with the releases of information however limited made to citizens and the public by the Hawaii Department of Health. The privacy laws of which you speak applied to Dr. Fukino just as much as they applied to Gov. Abercrombie. Dr. Fukino made her statements about seeing the birth certificate and that she was convinced that Obama was born in Hawaii. Gov. Abercrombie could therefore have made the same statements that Dr. Fukino made. She had no greater authority than the governor of the state to make such statements. He could have told us like she did that he found the long-form birth certificate, giving us the particulars as to its location, describing it without revealing its contents, and that as far as he can tell all was in order. That is not revealing any private information. His reassurance in this regard would have been important given that Hawaii senior election clerk, Tim Adams, said in a sworn affidavit that he was told numerous times by his supervisors in the election office that there was no long-form Certificate of Live Birth for Obama and that neither Queens nor Kapi'olani hospitals had any record of Obama being born there. Also, Gov. Abercrombie says that he knew "Barry" when he was a child and even was good friends with his parents. What would it have taken the good Governor to pick up the phone and call "Barry" to ask him if he would give his consent to release pertinent birth information to the public? What was the big secret with the long-form birth certificate given that in the end we learned that it did not contain any harmful information and only confirmed the COLB that Obama released in 2008? Also, please explain why Gov. Abercrombie, with or without Obama's consent, made no effort to approach Kapi'olani Hospital which contains the best evidence in this ordeal of Obama's place of birth. We still have not received any confirmation from Kapi'olani Hospital that Obama was born there. Where is all the fanfare (naming of Wings, dedications, historical markings, etc.) at that hospital that Obama was born there? We have debated the Obama place of birth issue ad nauseam but have still to see any medical records from or at least hear from Kapi’olani Hospital confirming Obama’s birth there. There is no reason why Obama cannot let Kapi'olani confirm his birth there. After all, he has released his alleged long-form birth certificate allegedly from Kapi'olani Hospital. What is so dishonest and despicable about Obama and his enablers, apart from hiding behind privacy laws, is that they say that the birthers will still doubt he was born in Hawaii even with the April 27, 2011 release of his alleged long-form Certificate of Live Birth when Obama has all the power to give the public the best evidence of this birth, confirmation from Kapi’olani Hospital. a fax and email, since she is my Representative. it was issued to a person born in 1890. To call or fax her offices see below. I am sure that many of you know that Orly Taitz has a case regarding Obama's social security number making its way through the District circuit in D.C.. It appears that she has won a " Motion to compel Rule 45 subpoena to grant the Plaintiff access to the original 1961 long form birth certificate of Mr. Barack Obama, stored at the Health Department, Stas of Hawaii is granted, So ORDERED-- Chief Judge US District Court District of Columbia Royce C. Lamberth." Any thoughts? Will this lead to anything? Where are you finding the motion signed by the judge. I can only find the doc that was sent to the judge by Orly Taitz with a place for his signature if he were to grant the motion. I also do not see where the judge has granted discovery as Orly Taitz states. I wish that it was true but I do not find it anywhere. I may be wrong but I believe that he will be ruling on the dispositive motion before him before ruling on any motions regarding discovery. Orly is a tireless pursuer of Barry, but makes lots of mistakes. I'm no legal expert, but I predict this goes n-o-w-h-e-r-e. I have a question that has been nagging me for sometime. It has to do with the 14th amendment and the original interpretation of “jurisdiction” as appears in the clause “subject to the jurisdiction thereof”. In 1868, there were two groups of people in the US who did not owe allegiance to anybody else: freed slaves and existing US citizens. After all of the US-born children of freed slaves were made citizens by the 14th amendment, wouldn’t the 14th amendment then be referring to just natural born citizens when it speaks of all persons born in the US and subject to the jurisdiction thereof? Or is there another group of people who do not owe allegiance to another country, whose US-born children would be citizens at birth but not natural born citizens? Could this other group be people who are considered “stateless”? If not, then are these born citizens of US citizens (persons not owing allegiance to anybody else) not natural born citizen because 1) it is implied that they are equal to naturalized citizens and/or 2) a natural born citizen is a citizen at birth by natural law and not by any human law, such as the 14th amendment? Having written, not published, a novel based on mail fraud and the politic al process, I won't claim to be an attorney, but at least not ignorant. That said, if the 'birth certificate' proves to be false, and if the party knew this, then i think each mailing becomes a single count of mail fraud. For those on this thread who may not have seen it, there is a new, updated report out from Paul Irey, a typography and type face expert. 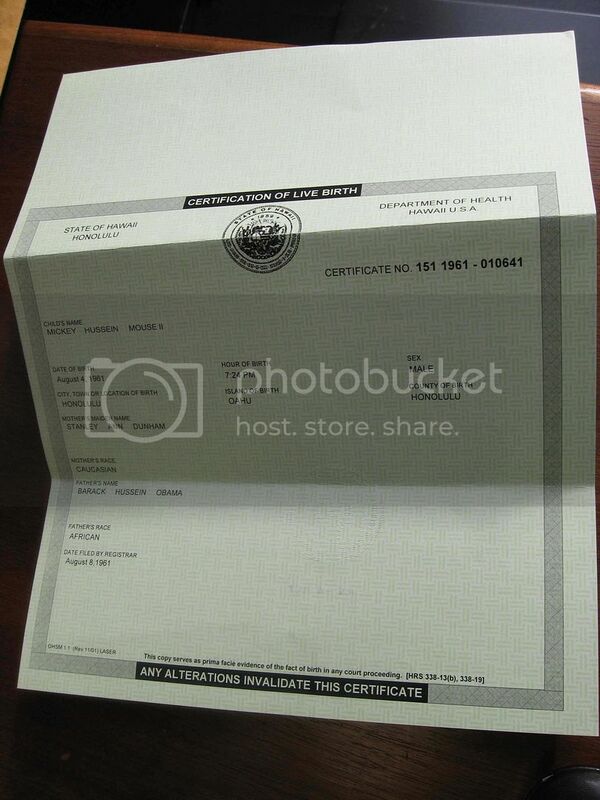 Flattened or layered the "birthday caked up document" Obama proffered to the world on 27 Apr 2011 via the digital manufactured PDF file and via the xerox copies handed out to the reporter is a FORGERY! I have heard on one hand that if Soetoro is removed from office due to ineligibily that all he has done is undone. All laws signed and appointments made are null and void. Others say no. He is out out and we move on from there and all that he did stands. Which scenario is correct? Here is another curve: what if he is out by virtue of the 2012 election and the fraud is proven after leaving office. What happens then to all of the actions he took while in office? Please note the necessary precision of words. The "flattening" of the image was a deliberate cover-up by the conspirators of 1600 Pennsylvania Ave. The release of a layered document is "fingerprint/forensic" proof of a composed heterogeneous document that an oxymoron to the claim of it being a scan of the birth certificate "on file" at HIDoH. By a posterori flattening it with distributing the printed version the conspirators are hoping to contaminate the data stream into the future. What they will likely do in a few weeks/months is replace the layered document with the flattened document as the document of record/distribution and the media would have done their "Trojan horse" job again. I hope you had a good weekend. No, he was limited by the law and he was aware of that fact. He later discovered he could not legally release more information. ”State Attorney General David Louie told the governor he can't disclose an individual's birth documentation without a person's consent, Abercrombie spokeswoman Donalyn Dela Cruz said." "There is nothing more that Gov. Abercrombie can do within the law to produce a document," said Dela Cruz. "Unfortunately, there are conspirators who will continue to question the citizenship of our president." Hawaii statutes allow the DOH to make verifications of vital events. "§338-14.3 Verification in lieu of a certified copy - (a) Subject to the requirements of section 338-18, the department of health, upon request, shall furnish to any applicant, in lieu of the issuance of a certified copy, a verification of the existence of a certificate and any other information that the applicant provides to be verified relating to the vital event that pertains to the certificate." "(b) A verification shall be considered for all purposes certification that the vital event did occur and that the facts of the event are as stated by the applicant." "(c) Verification may be made in written, electronic, or other form approved by the director of health." "We don't have plans to do anything," said Kapiolani Medical Center spokeswoman, Claire Tong, when asked how the center plans to commemorate the soon-to-be 44th U.S. president, who, according to Obama's family and other sources, was born at that hospital on Aug. 4, 1961." "We can't confirm or deny it — even though all the information out there says he was born at Kapiolani Hospital. And that's because of the HIPA law." Tong acknowledged that the center has received daily inquiries from news agencies far and wide asking for confirmation of Obama's birthplace. Much as she wishes she could do it, Tong said it's not possible. Hawaii statutes only require a hospital to maintain medical records for seven years past the last date of service. It is unlikely that there are any medical records at Kapiolani. Although, there may be a birth register. "We must be concerned if his staff is unable to deter him from his base, unpresidential behavior and emotional meltdowns. What can we expect when he comes face to face with the full wrath of a populace that realizes the diorama he painted in 2008 is a tsunami that will make the one Japan experienced look like a windblown backyard on a fall day?" 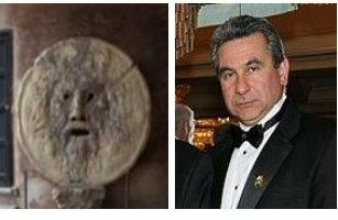 Seeing that this is the Bocca Della Verita blog, I am prompted to ask you: Do you sense that Mr. Obama has been untruthful? If so, what do you sense motivated him? Clearly, given his intelligence, education and interpersonal talent, he would have succeeded without deceit. Also, as Mr. Massie suggests, what sort of wrath will Mr. Obama face, when Truth emerges?